The kid has been asleep for nearly two hours, so I have time to show off what crafty goodness I've had on my needles of late. Exhibit number one is a wrap cardigan, made in Cleckheaton Country Naturals 8ply (colour Camel) using Dairne's own pattern. So nice. The kid will have to bulk up quite a bit to fit it though. Next winter perhaps? I've been paying more attention to finishing garments, getting the sewing up to look pretty. It's usually the bit I rush and make mistakes on, so I made an effort to take my time and get it right with this one. I'm very pleased with the result, thankyouverymuch. 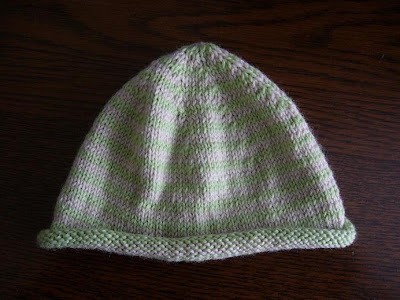 Exhibit number two is my first ever hat. It's in Cleckheaton Cocoon 4ply and Patons Dreamtime 4ply. I don't know if it's kosher to mix yarn like that, but I couldn't get the colours I wanted in the same yarn, so there you go. This is a Moda pattern with a matching envelope-neckline jumper, both of which I am making for a yet-to-be-born little dude due at the end of the year. I'd wear that cardigan if I was young again...and smaller. Like the wrap design and the hat would suit this London weather. 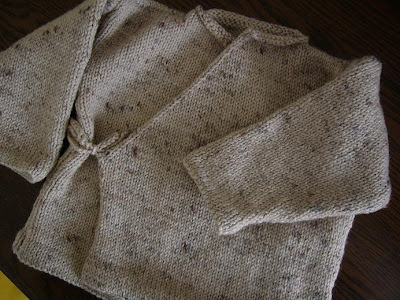 dairne knitted one of those cardies for keira when she was wee. it was the best ever.